Manufacturer & Exporter of Laminar Air Flow Bench. Our product range also comprises of Electronic Microscope, Laboratory Equipment and Glass Wares. With sincerity and hard work of our professionals, we have carved a niche for ourselves in this domain by offering Laminar Air Flow Bench. This air flow bench is tested in terms of quality for assuring its excellence. Our given air flow bench is developed to provide an individual clear air environment for small items no requiring a full-size clean room. In addition, the offered air flow bench is used for specialized work such as tissue culture to eliminate airborne contamination. 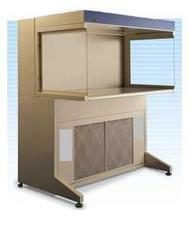 Looking for Laminar Air Flow Bench ? Cleaveland Flash Point & Fire Point Apparatus.